Be your motivation necessity or nostalgia, if you want to make a call from one of the last remaining red phone boxes in Northern Ireland, make your way to Enniskillen. According to BT, there are 25 of the iconic payphones in the County Fermanagh town. That's almost twice as many as any other village, town or city. There are now fewer than 200 left across Northern Ireland. 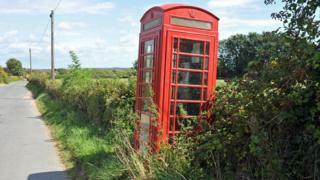 "There are currently 1,660 payphones in Northern Ireland, of which 184 are red kiosks," said a BT spokesman. In 2016, there were 201. The design classic red phone boxes were woven into community life for much of the 20th Century. Introduced in 1936 to commemorate the Silver Jubilee of King George V's coronation, the red phone boxes built on an earlier 1924 design and soon became an integral part of the national landscape. By 1980, there were 73,000 of the Sir Giles Gilbert Scott-designed kiosks across the UK; BT said some 9,500 were still in use. Once regarded as the cutting edge of telecommunications, the kiosks are now considered more as part of the nation's heritage. Twenty seven of those still in use in Northern Ireland are designated as grade II listed buildings. And they will be with us a little while longer. "We have no plans to reduce the number of payphones in Northern Ireland," said the BT spokesman. BT's "adopt a kiosk" scheme allows communities across the UK to take over a decommissioned telephone kiosk for £1. Although the new owners are not allowed to install "electronic communications apparatus", more than 5,000 have been snapped up and put to a variety of uses, including libraries, defibrillator kiosks and information centres. It must be hard for many who know only the era of the smart phone to think that anybody - let alone everybody as it once was - would step inside a box, drop their coins into a slot and dial a number to make call. But the past, as they say, is a foreign country, and they do things differently there. While we may live in a world of contactless payments and electronic transactions, the cheque book was once an essential part of personal finance. The first cheque was written more than 350 years ago and its usage peaked in 1990, when there were more than 4bn cheque transactions in one year. Although their use has declined in recent years, there were still 477m cheques written in the UK in 2016. Banks have promised to keep processing them for as long as necessary. We didn't always have cloud storage space or flash drives. Once upon a time, the floppy disk was where we stored our data. Developed in the 1960s to replace tape drives, companies like IBM and Sony refined floppy disks for the mass market: They offered around 1.2 megabytes of data. At their mid-nineties peak, about five billion were sold annually. What was there not to love about the classic VHS tapes? You could rent movies from the video shop and enjoy in the comfort of your own home. And you could record television programmes to watch later. But what we once watched on video, now we stream and download. Ceefax (so named as it allowed BBC viewers to "see facts") was launched in 1974 to provide the latest news headlines, sports scores, television listings and, latterly, lottery results. In the pre-internet era, this is where you got information in real time. Hitting the text button on your TV remote opened up a whole new world. Teletext was the equivalent service on channels such as ITV and Channel 4 in the UK. In the tech age, sales of maps might be expected to plummet. But, according to Ordnance Survey, sales of paper maps are on the rise. "People are now realising the importance of mapping and the need to carry both types from a safety point of view," said OS Managing Director of Leisure Nick Giles this year. "You actually get a different experience with paper. You can lay it out on the dining room table and get a wider overview of an area beforehand." During the 2017-18 financial year, sales of OS's paper maps grew by 7%, with 1.73m maps sold.